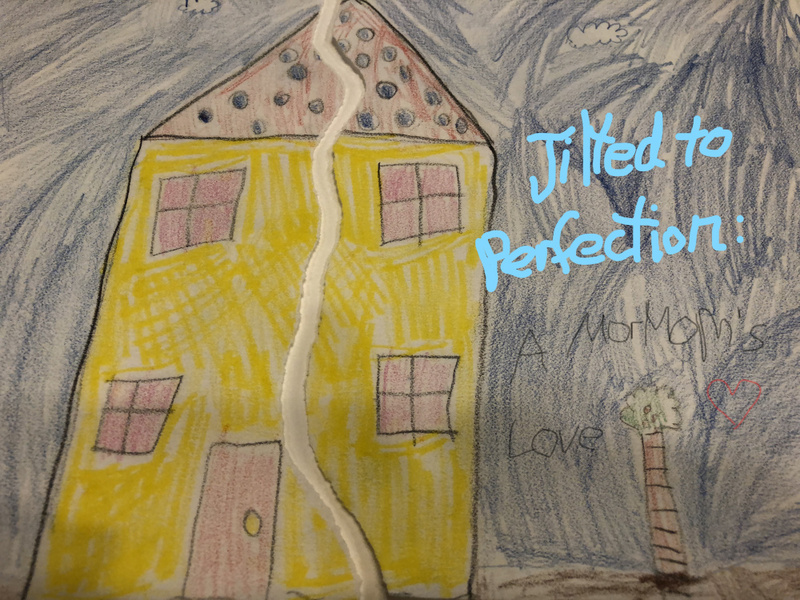 Voice teacher, performer, and writer, Debra Cook’s musical, Jilted to Perfection: A MorMom’s Love was selected to be a part of New York New Works (NYNW) festival. Cook’s production not only made its way from Park City, Utah to New York, but it also advanced to the finals round of the competition. 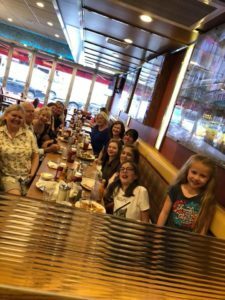 From NYNW’s website: “NYNW was created in 2014 as a fun give back project to expose the work of top, aspiring writers to legitimate Broadway producers and T.V. professionals. . .30-40 shows are selected from hundreds. EVERY submission is reviewed by at least one Broadway producer.” The 2018 festival took place from September 4 to 22 in the heart of Broadway. 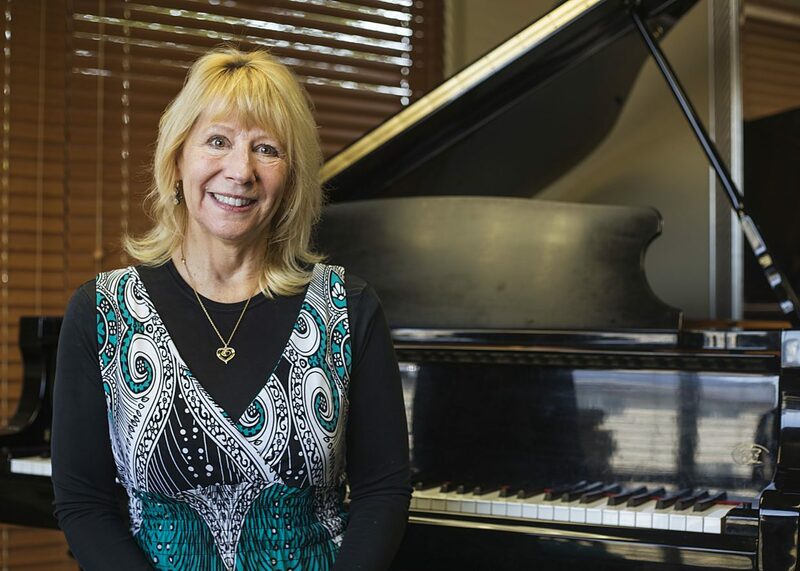 I recently spoke to Debra Cook about her intensely fulfilling experience. How long of a process was it to write and compose Jilted to Perfection? Although I view it as a work in progress, the final script took about 7 months. The parameters of this festival are to show only 25 minutes of a work to Broadway producers. They know if they are interested in a show after a few minutes. As a result, we worked to present a format where the piece had a beginning-middle-end in digest form which might be both humorous and moving in the process. Having participated in this festival the previous year on the creative team and as musical director of a three-hour musical, I understood the challenge required to condense the essence of it into 25 minutes. We trusted that our audience would get the nuances. With this structure, I was able to create the show into three sections and write those songs first. I then filled in the story. That led to six shorter songs with connecting monologues between. Writing with two concept collaborators started in February. Although the concept collaborators did not realize our original idea of the show, their work helped to launch the piece and give it structure and clarity of purpose. Most musicals have a creative team, a director, consultants, arrangers, etc., and this was no different. A New York director, coaches, a copyist, admin and accounting helpers were all gathered to further the work. What was the process of composing the songs like for you? Did you start with a melodic idea based on the words or did you start with the harmonic structure? I have not composed anything unilaterally since college assignments, so the process of composing the songs was a new adventure, and an arduous one at that. My process was a conglomeration of all the above and somewhat confusing and hard-fought. For instance, the song that was written after submission and added to the musical, “Jodie Foster’s Father is a Con Man,” was first conceived only as an opening phrase during the first week of writing, along with a funky base line that seemed to capture the sentiment and irony of the song’s story. The rest of the words came several months later when I felt the piece needed something more. The bass line was revised, and a voice line developed from the jump-started initial motif from months before. Over the phone I sang the song for my non-musician sister. Her good advice lead to a cut of a non-essential second verse, trimming the bridge to 4 measures, and weighing choices of which lyrics worked best. Did you compose with specific voices in mind? Yes, I had the musical theater version of my own voice in mind, thus taking up the challenge of Classical Singer’s Mark Stoddard, who encourages development of one’s career through one’s own projects. 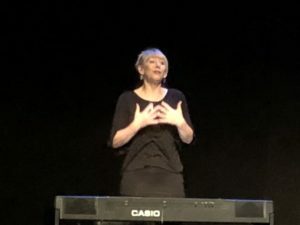 The last song, however, was conceived for three-part women’s voices, as the piece was originally conceived for three women, and their contribution did not lead to this iteration of the show. Thus, it was tweaked for a child to sing, and my six-year-old granddaughter, sang the finale, followed by an ensemble of several in three-part harmony. 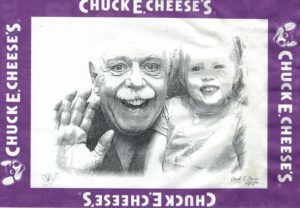 It worked, and now I think my granddaughter is famous. What was the process of bringing an entire mini-production from Utah to New York TWICE?? We performed three times, as Jilted to Perfection was selected for a finals round of the festival. These showings were all about a week apart, so we had to have two separate ensembles, knowing that it would be too costly to have ensemble members stay so long in NYC for a show they were performing for free. More of a challenge was to hobble some very gracious singers to come back out to NYC for a third show. The pay-off for those returning was the invitation to sing that finale, “The Good Fight Hallelujah,” for the United Nations International Day of Peace Celebration in Times Square! The performance was televised and live streamed, and we were also asked to sing a second number. It was an unexpected exposure of our new work. A challenging part of the production was the fact that most off-Broadway theatres do not provide pianos! An acoustic piano, for liability concerns, was not even allowed! Since the on-stage grand piano was integral to the concept of this piece, my search for an appropriate electronic piano was a saga. Substandard units were available for rent for over $700….yes, over $700! Those pianos needed amps or a clumsy hook-up to the theatre’s sound system, which would not work for an acoustic piece. A previous tech trip to NYC revealed that a different festival in the same theatre had poor results when hooking up to the house system, and an amp with a keyboard was artificial, as well. So, I found a model with high quality speakers built into the base of the unit, and for about the same price (I’m a dealer in the brand), we were able to drop-ship a new piano to NYC. It worked well, but then, while being stored in the theatre, turned up damaged and unplayable before our final show. No one would fess up or take responsibility for the damage, and we had no choice but to spend the afternoon attempting to repair it ourselves. Three hours later, it was marginally playable with two keys that did not work. We had no choice but to play the show anyway…sans two keys. Yes, self-producing away from home can be a real trick, and, despite the best laid plans, there are glitches along the way. It is pretty tempting to turn from the fun and grateful artist to bridezilla of the event. Outside of the stated goal to make the process fun, perhaps the fact that I had to be responsible for 2 weeks for my 6-year-old granddaughter cast member, I could not afford to lose it in front of her. Did you always have dreams of singing on Broadway? Always! Who wouldn’t? But, I never really admitted it. So, when moving back east after landing a NYC classical agent in the early 90’s, I tried to cross over into musical theatre, but it was too much to do as a single Mom of two kids with no child support or alimony. When making that cross-country move from Utah to the NY Metropolitan area decades ago, I sold my home teaching business with just enough money for a moving truck, a month’s rent, and cat food for a new litter of kittens. I needed money to support the children fast. I started a successful real estate consulting business with a friend securing property tax reductions for large industrial and commercial properties. After a few years, the non-artist work was eating my soul away. I cashed out and devoted myself full-time to performing arts aspirations (a big financial risk). The cycle was repeated when moving to L.A. when Fred and I married. Jilted goes into some of that craziness of two artists once again re-booting their careers through a geographic uprooting in the show’s song, “Jodie Foster’s Father is a Con Man.” Yes, we were one of Lucius Foster’s victims in his Los Angeles shenanigans wherein he contracted without a license while simultaneously using his daughter’s reputation to claim he could connect us with producers for Fred’s screenplay. Foster left with our money and our Hollywood home in shambles. Sweet talking Foster was later sentenced to 5 years in prison for real estate fraud at age 89 and used a walker to get there! Performing and life is much about taking risks and making choices, weighing the options and hoping you make a good choice. Such is the theme of the musical. …Seated at a keyboard, Cook relates her self-described “squirrely” odyssey through life, swerving from one idealistic disaster to another, always trying to answer the questions, “Is it true that when you’re in love, you see all their brokenness and mess and love them anyway? Love them more?”…The show ends with a surprise finale that I won’t spoil. But it is only one of the many unexpected and wonderful twists in this marvelous mini musical.